A knobbly beauty with a memorable taste which has been kept going by enthusiasts since its introduction in the 1850s. Potato Pink Fir Apple is a classic salad variety and in the top ten for flavour, best cooked in its skin and enjoyed hot or cold with butter. Its unique 'earthy' flavour improves with storing. Potatoes are one of the most rewarding vegetables to grow. 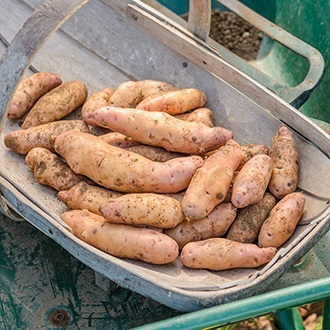 There’s the nurturing process of chitting, planting and earthing-up, the anticipation of a good harvest as you dig through the soil and, of course, the unbeatable taste of fresh, home-grown, new potatoes.